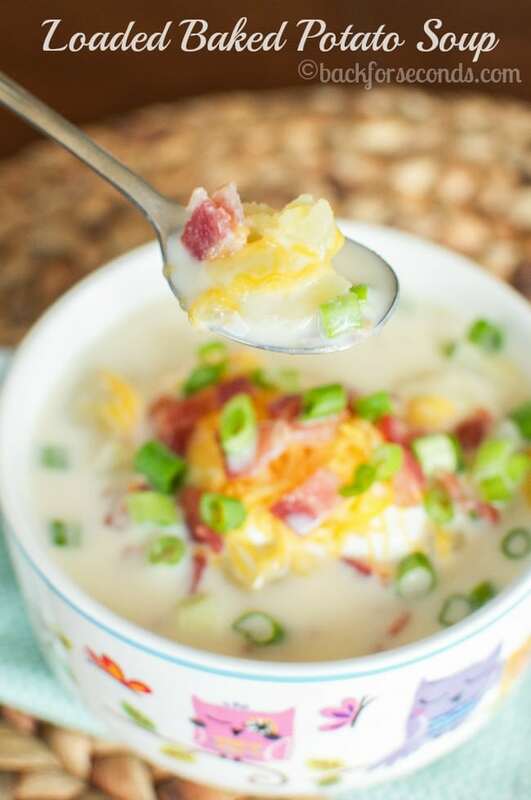 This easy Loaded Baked Potato Soup takes just 20 minutes to make and is incredibly delicious. 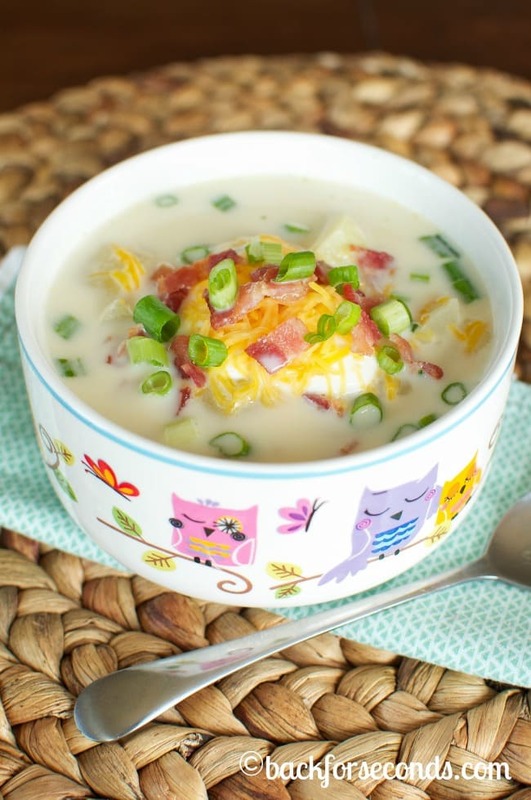 Cheese and bacon make this a soup that will be requested often! 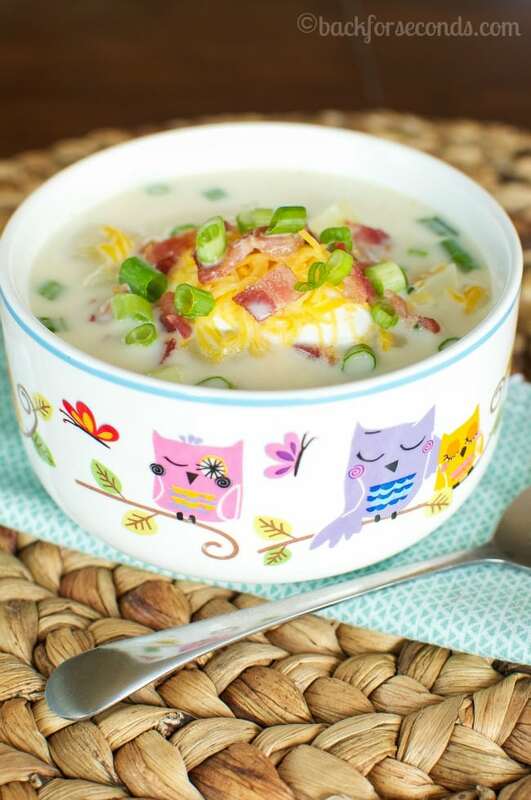 Loaded Baked Potato soup is one of my all time favorites! This recipe is so awesome because it is super simple to make and can be on the table before everyone starts asking, “what’s for dinner??”. I am always thrilled to find new, delicious recipes that are quick and easy. I have 6 mouths to feed (with another on the way) and I don’t have tons of time to spend in the kitchen. Anytime I find a recipe that everyone loves, and doesn’t take all day to make, I am a happy mama! What are some of your favorite fast dinners? Do you get you family involved in the cooking process? I find that if my kids help make the food, they are more likely to enjoy eating it too! I don’t know how anyone could not enjoy this soup. Potatoes, cheese, bacon!!! What’s not to love?! I hope you give it a try! ***I doubled this recipe since I have a big family to feed. With the extra potatoes you would need to add about 5 minutes of cooking time. Makes great leftovers too! 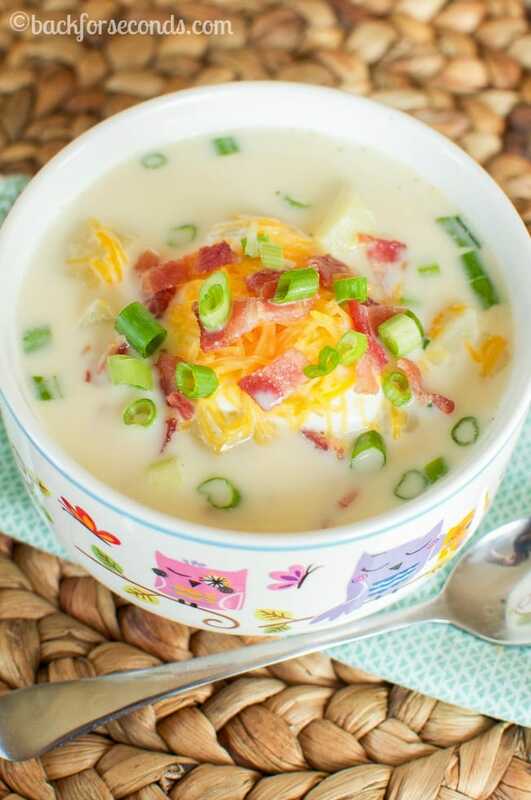 This is potato soup perfection! looks amazing!! I really really love potato soups!! Yours looks so good, pinned it! Nothing more comforting than a soup like this! Loaded baked potato soup is one of the very best soups ever invented. 6 mouths to feed and another on the way?? Congrats!! I didn’t know you were going to have another baby! Isn’t your youngest just 1? I am amazed how much you do on your blog with a busy life! I’ve overloaded and I’ve just got 3 kiddies! This looks like something my family would really enjoy! Thanks for sharing! This is one of my favorite too! I love how quick and easy this is! Wow Stephanie! What an amazing soup! With simple ingredients, easy to follow and so delicious! :) We live in Greece and we don’t have sour cream here, can we substitute with Greek yogurt? Does that sound correct? Thanx so much for sharing! Oh my heck, this looks SO amazing. I have a hard time getting my family on board with soup, but this just might be the recipe that opens their eyes! Can’t wait to make this, thank you for the great recipe!